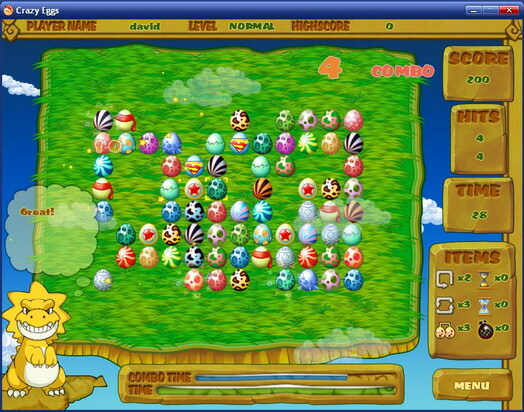 Crazy Eggs is a puzzle game that fun for your whole family. Start your adventure on the floating Dinosaur Island where you will help a tyrannosaurus collect lost eggs. Connect matching eggs with straight lines to clear the board and move on to your next destination. Special items will bring endless changes and unexpected adventures along your journey. You can play it together with your family, and challenge them to a game of logic, precision and speed.If you feel like playing the game in a relaxed mood, you can choose the casual mode that has no time-limit. That way, you will be able to think deep and plan out the matching sequence that will result in the highest combo possible.You can also play the challenge mode to put your reflex speed to test, and see how you perform under the most extreme tests.The goal in your game is to link up dinosaur eggs of the same pattern, and clear all eggs on board within a time limit.